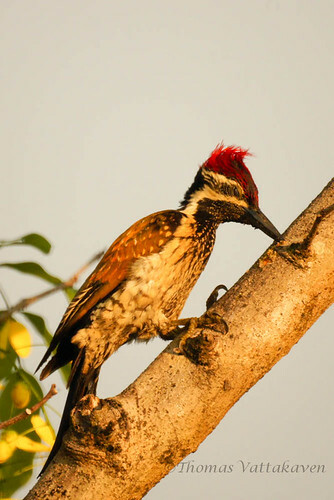 Nature Magnified: What Makes a Woodpecker Good at Woodpecking? 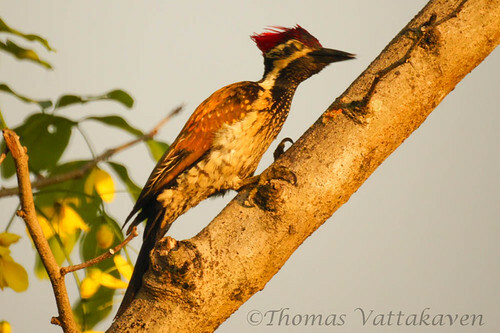 What Makes a Woodpecker Good at Woodpecking? If you have ever tried to bite a tree trunk, perhaps you would have a very good idea how hard wood can be! (perhaps you ought to try it now!). Well, even without it, you may be able to appreciate something which goes about its life knocking its head against wood! 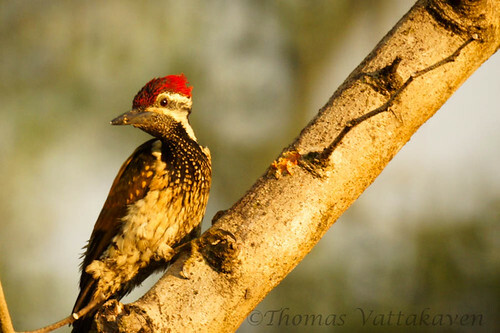 I’m talking about woodpeckers. In nature, each member is specialised to exploit a particular niche, so as to efficiently utilise available resources and avoid as much competition from other species as possible. 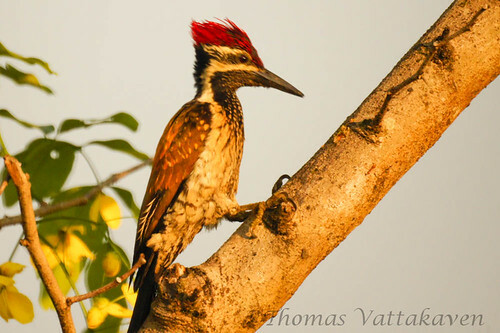 Certain evolutionary adaptations are what makes them different from other birds. 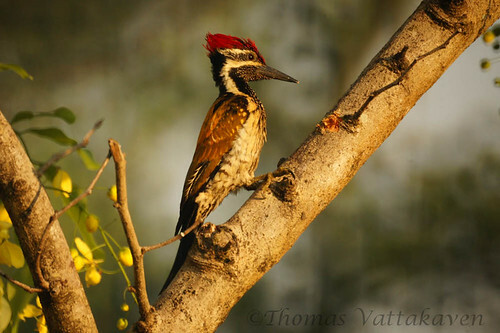 As you can see from the images, woodpecking is something a woodpecker can do with its eyes closed shut (literally!) 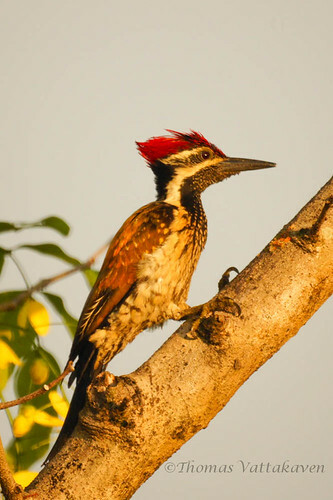 Lets take a look at what makes a woodpecker suited for such a job. 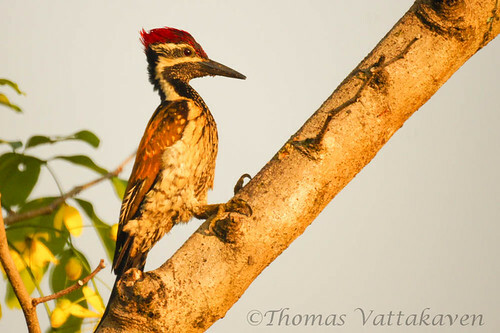 The woodpecker goes about pecking into wood, so as to extricate grubs and other insects that may be living within the tree trunks. 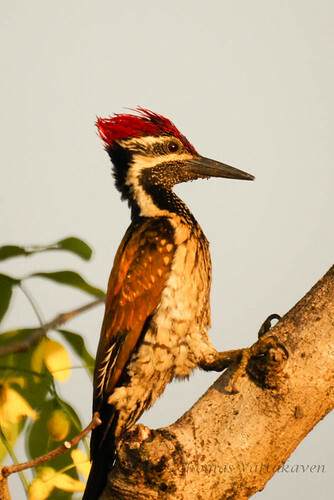 Its beak is composed of very strong bones and is covered by tough horny layer. Some species have chisel shaped beaks or longitudinal ridges to reinforce their strength and efficiency. Their nostrils are reduced to mere slits in order to prevent wood chips from getting in. 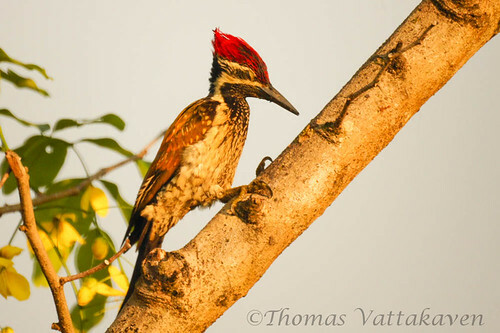 The brain of the woodpecker is very small in order to minimise the impact forces as the bird hammers away at the tree trunk. The force of the impact is transmitted mainly below the brain. The bird has a special hinge in between the beak and the skull, the muscles of which helps to absorb the shock of having to hammer at wood, which helps to reduce the impact to the brain. This joint also locks the beak together during woodpecking and prevents it from opening up due to the impact. 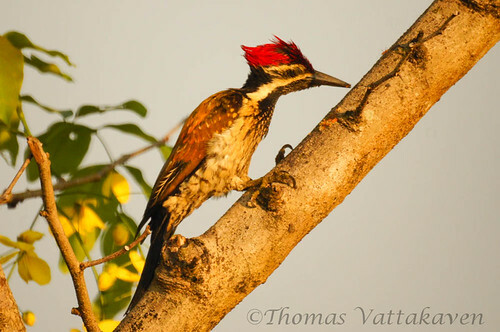 Woodpeckers have stiffened tail feathers that serve to brace the body against tree trunks and allow it to balance. The tongue of these birds are modified into a barbed apparatus which is used to harpoon insects out of holes and wedges. 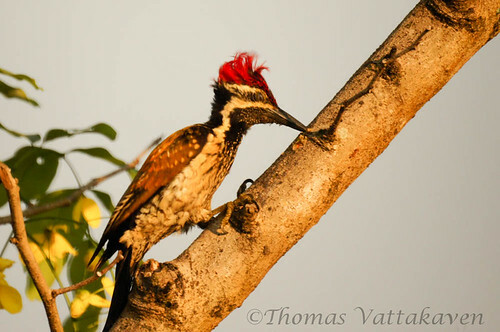 The tongue is exceptionally long and can be stretched out to capture the prey ad retrieve it.The saliva of the woodpecker is also very glue-like and sticky to help secure the insects. The hyoid apparatus, a set of bones and muscles connected to, and controlling, the tongue is also exceptionally long and when extended helps to push the tongue out of the bill. However sometimes the tongue adaptation can work against the bird. 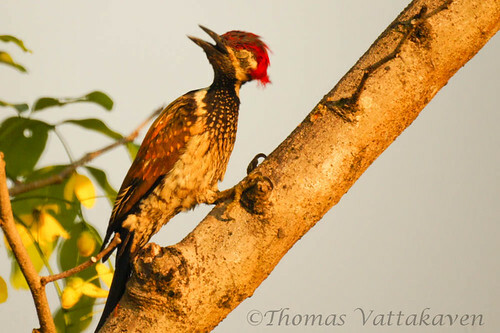 It is not unknown for the tongue of woodpeckers to get stuck in tree cavities, and cause death (see here).